Aura Bliss soap has an aroma of sensual mystique with floral and citrus notes along with lavender, sage and a touch of mint. Feast your eyes, your senses and pamper your skin. It is made with natural oils and butters for a silky soft skin. 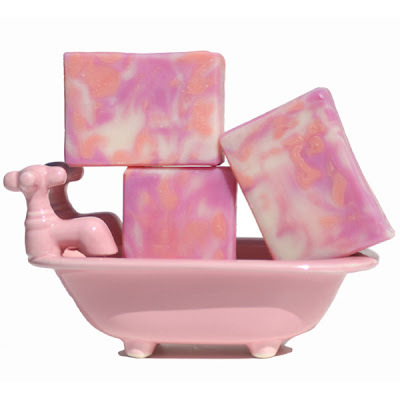 Each soap bar is swirled with pink and peach and is unique. Each batch is made with Olive, Coconut, Palm Kernel, Fair Trade Shea Butter, Castor oil, Soybean, Sodium Hydroxide, Beeswax, Sodium Lactate, Mica and Fragrance. It is available in my Ginger’s Garden store. My handmade artisan soaps make wonderful gifts for a birthday, welcome home, a new mom or a co-worker. Buy a bar or two today and see how beneficial handcrafted soaps can be for your skin.